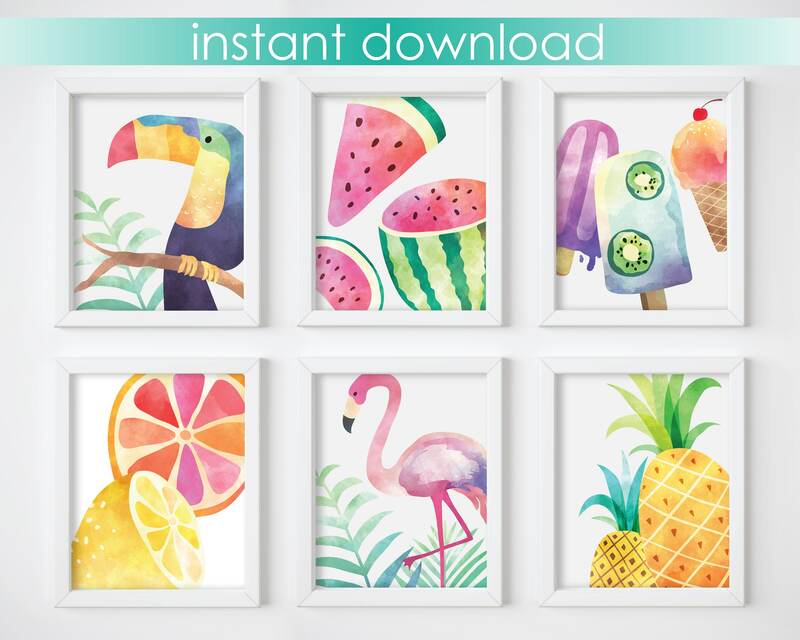 This listing is for 6 beautiful digital prints of cute, colorful watercolor textured tropical designs. This is an instant download, allowing you to quickly and easily add some flare to your home decor! This unique print was created from my original artwork, and it would make the perfect (and budget friendly) gift for any occasion! • No actual art print will be mailed. DIGITAL FILE ONLY. • Colors may look different depending on your screen settings. • Due to the nature of this product, no refunds or exchanges will be given. • After your payment is confirmed, you will download your files directly from Etsy. Simply go to https://www.etsy.com/your/purchases to find your printable files. • For best results, use your printer's best settings and high quality paper. • You can also have the file printed by an online print service or a local print shop. • The files are for personal use only. • Sharing the files is not allowed. • Selling the files or a printed copy is not allowed. • You may print as many copies as you would like for personal use.